Status: Deceased; Active 1966-1977. Born: 1933-11-10. Died: 1990-04-17. Spaceflights: 1 . Total time in space: 12.58 days. Birth Place: Saint Francis, Kansas. PERSONAL DATA: Born November 10, 1933, in St. Francis, Kansas. Died April 6, 1990, in Scottsdale, Arizona, of a heart attack. He is survived by his wife Jan and two children. EDUCATION: He graduated from Highland Park High School in Topeka, Kansas; received a Bachelor of Science degree in Electrical Engineering from the University of Kansas in 1956 and a Master of Science degree in Aeronautical Engineering from the U. S. Naval Postgraduate School in 1964. SPECIAL HONORS: Presented the NASA Distinguished Service Medal in 1973; the Johnson Space Center Superior Achievement Award in 1970; the Navy Distinguished Service Medal in 1973; Navy Astronaut wings; eight Air Medals, the Viet Nam Service Medal; and the Navy Commendation Medal with combat distinguishing service in 1966; the University of Kansas Distinguished Service Citation in 1973; Kansan of the Year in 1972. EXPERIENCE: When notified of his selection to the astronaut program, Evans was on sea duty in the Pacific-assigned to VF51 and flying F8 aircraft from the carrier USS TICONDEROGA during a period of seven months in Viet Nam combat operation. He was a combat flight instructor (F8 aircraft) with VF-124 from January 1961 to June 1962 and, prior to this assignment, participated in two WESTPAC aircraft carrier cruises while a pilot with VF-142. In June 1957, he completed flight training after receiving his commission as an Ensign through the Navy ROTC Program at the University of Kansas. Total flight time accrued during his career is 5,100 hours, including 4,600 hours in jet aircraft. NASA EXPERIENCE: Captain Evans was one of the 19 astronauts selected by NASA in April 1966. He served as a member of the astronaut support crews for the Apollo 7 and Apollo 11 flights and as backup command module pilot for Apollo 14. On his first journey into space, Captain Evans occupied the command module pilot seat for Apollo 17 which commenced at 11:33 p.m. (CST), December 6, 1972, and concluded on December 19, 1972-the last scheduled manned mission to the moon for the United States. He was accompanied on this voyage of the command module "America" and the lunar module "Challenger" by Eugene Cernan, spacecraft commander, and Harrison H. (Jack) Schmitt (lunar module pilot). While Cernan and Schmitt completed their explorations of the Taurus-Littrow landing area down on the lunar surface, Evans maintained a solo vigil in lunar orbit aboard the "America", completing assigned work tasks which required visual geological observations, hand-held photography of specific targets, and the control of cameras and other highly sophisticated scientific equipment carried in the command module SIM-bay. Evans later completed a 1-hour, 6-minute extravehicular activity during the transearth coast phase of the return flight, successfully retrieving three camera cassettes and completing a personal inspection of the equipment bay area. This last mission to the moon for the United States broke several records set by previous flights which include: longest manned lunar landing flight, 3 01 hours, 51 minutes; longest lunar surface extravehicular activities, 22 hours, 4 minutes; largest lunar sample return, an estimated 115 kg, 249 lbs. ; and longest time in lunar orbit, 147 hours, 48 minutes. Apollo 17 ended with a splashdown in the Pacific Ocean approximately 0.4 mile from the target point and 4.3 miles from the prime recovery ship, the USS TICONDEROGA. Completing his first space flight, Captain Evans logged 301 hours, 51 minutes in space-1 hour, 6 minutes of which were spent in extravehicular activity. He holds the record of more time in lunar orbit than anyone else in the world. Evans was backup command module pilot for the Apollo-Soyuz Test Project (ASTP) mission. This joint United States-Soviet Union earth-orbital mission, launched successfully in July 1975, was designed to test equipment and techniques that would establish an international crew rescue capability in space, as well as permit future cooperative scientific missions. Evans retired from the United States Navy on April 30, 1976, with 21 years of service, and remained active as a NASA astronaut involved in the development of NASA's Space Shuttle Program. He served as a member of the operations and training group, within the astronaut office, responsible for launch and ascent phases of the Shuttle flight program. BIRTHPLACE AND DATE: Evans was born November 10, 1933, in St. Francis, Kansas. EDUCATION: Bachelor of Science degree in electrical engineering from the University of Kansas in 1956. Master of Science in aeronautical engineering from the U.S. Naval Postgraduate School in 1964. EXPERIENCE: Evans entered the Navy after graduation and completed flight training and served aboard aircraft carriers in the Western Pacific. In 1961 - 1962 he was a combat flight instructor for F-8 fighter pilots. Thereafter he flew combat missions in the F-8 for seven months from the carrier USS Ticonderoga. NASA selected Evans as an astronaut in April 1966. He was backup Command Module pilot on Apollo 14 and flew as Command Module pilot on Apollo 17, with Commander Gene Cernan and Lunar Module pilot Harrison H. (Jack) Schmitt. This final Apollo lunar mission was launched on December 7, 1972. While Cernan and Schmitt drove their Lunar Rover across the surface in three separate excursions, Evans maintained a solo vigil in the Command Module, mapping the moon from lunar orbit with cameras and scientific instruments. After the Lunar Module docked up with Command Module the astronauts spent two more days in lunar orbit to collect additional data. During voyage back to Earth, Evans took a 1 hour-6-minute deep space walk to retrieve film and data tapes from the Command Module instrument bay. The longest Apollo lunar mission - 301 hours, 51 minutes - ended with a December 19 splashdown in the Pacific Ocean. 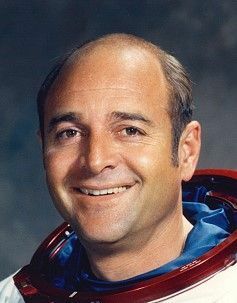 Evans served as backup Command Module pilot for the 1975 joint U.S.-Russian space mission, Apollo-Soyuz Test Project, and was thereafter involved in development of the Space Shuttle. He retired as a captain from the Navy in 1975 and from NASA in March 1977. He was later Director of Space Systems Marketing for Sperry Flight Systems. He died April 6, 1990, in Scottsdale, Arizona, of a heart attack. Family: Astronaut. Country: USA. Flights: Apollo 14, Apollo 17, Apollo (ASTP). Projects: Apollo, ASTP. Agency: USN. Bibliography: 5361. 1933 November 10 - . Birth of Ronald Ellwin Jr 'Ron' Evans - . Nation: USA. Related Persons: Evans. American pilot astronaut 1966-1977. 1 spaceflight, 12.6 days in space. Flew to orbit on Apollo 17 (1972)..
NASA Astronaut Training Group 5 selected. - . Nation: USA. Related Persons: Brand, Bull, John, Carr, Duke, Engle, Evans, Givens, Haise, Irwin, Lind, Lousma, Mattingly, McCandless, Mitchell, Pogue, Roosa, Swigert, Weitz, Worden. The group was selected to provide pilot-astronauts for the Apollo Applications Program (then planned as 10 lunar landings after Apollo 11 and 30 Apollo flights to earth-orbit space stations).. Qualifications: Qualified jet pilot with minimum 1,000 flight-hours, bachleor's degree in engineering or physical or biological sciences, under 35 years old, under 183 cm height, excellent health. US citizen.. 351 applications (including six women and a legless US Navy pilot). All 19, except X-15 astronaut Engle, would fly into space on Apollo or Skylab missions. Engle and six others would fly shuttle missions. 1971 January 31 - . 21:03 GMT - . Launch Site: Cape Canaveral. Launch Complex: Cape Canaveral LC39A. Launch Platform: LUT2. Launch Vehicle: Saturn V.
Apollo 14 - . Call Sign: Kitty Hawk. Crew: Mitchell, Roosa, Shepard. Backup Crew: Cernan, Engle, Evans. Support Crew: Chapman, McCandless, Pogue. Payload: Apollo CSM 110 / Apollo LM 8 / ALSEP / S-IVB-509. Mass: 29,230 kg (64,440 lb). Nation: USA. Agency: NASA Houston. Program: Apollo. Class: Moon. Type: Manned lunar spacecraft. Flight: Apollo 14. Spacecraft: Apollo CSM. Duration: 9.00 days. Decay Date: 1971-02-09 . USAF Sat Cat: 4900 . COSPAR: 1971-008A. Apogee: 183 km (113 mi). Perigee: 170 km (100 mi). Inclination: 31.12 deg. Period: 88.18 min. The Apollo 14 (AS-509) mission - manned by astronauts Alan B. Shepard, Jr., Stuart A. Roosa, and Edgar D. Mitchell - was launched from Pad A, Launch Complex 39, KSC, at 4:03 p.m. EST January 31 on a Saturn V launch vehicle. A 40-minute hold had been ordered 8 minutes before scheduled launch time because of unsatisfactory weather conditions, the first such delay in the Apollo program. Activities during earth orbit and translunar injection were similar to those of the previous lunar landing missions. However, during transposition and docking, CSM 110 Kitty Hawk had difficulty docking with LM-8 Antares . A hard dock was achieved on the sixth attempt at 9:00 p.m. EST, 1 hour 54 minutes later than planned. Other aspects of the translunar journey were normal and proceeded according to flight plan. A crew inspection of the probe and docking mechanism was televised during the coast toward the moon. The crew and ground personnel were unable to determine why the CSM and LM had failed to dock properly, but there was no indication that the systems would not work when used later in the flight. Apollo 14 entered lunar orbit at 1:55 a.m. EST on February 4. At 2:41 a.m. the separated S-IVB stage and instrument unit struck the lunar surface 174 kilometers southeast of the planned impact point. The Apollo 12 seismometer, left on the moon in November 1969, registered the impact and continued to record vibrations for two hours. After rechecking the systems in the LM, astronauts Shepard and Mitchell separated the LM from the CSM and descended to the lunar surface. The Antares landed on Fra Mauro at 4:17 a.m. EST February 5, 9 to 18 meters short of the planned landing point. The first EVA began at 9:53 a.m., after intermittent communications problems in the portable life support system had caused a 49-minute delay. The two astronauts collected a 19.5-kilogram contingency sample; deployed the TV, S-band antenna, American flag, and Solar Wind Composition experiment; photographed the LM, lunar surface, and experiments; deployed the Apollo lunar surface experiments package 152 meters west of the LM and the laser-ranging retroreflector 30 meters west of the ALSEP; and conducted an active seismic experiment, firing 13 thumper shots into the lunar surface. A second EVA period began at 3:11 a.m. EST February 6. The two astronauts loaded the mobile equipment transporter (MET) - used for the first time - with photographic equipment, tools, and a lunar portable magnetometer. They made a geology traverse toward the rim of Cone Crater, collecting samples on the way. On their return, they adjusted the alignment of the ALSEP central station antenna in an effort to strengthen the signal received by the Manned Space Flight Network ground stations back on earth. Just before reentering the LM, astronaut Shepard dropped a golf ball onto the lunar surface and on the third swing drove the ball 366 meters. The second EVA had lasted 4 hours 35 minutes, making a total EVA time for the mission of 9 hours 24 minutes. The Antares lifted off the moon with 43 kilograms of lunar samples at 1:48 p.m. EST February 6. Meanwhile astronaut Roosa, orbiting the moon in the CSM, took astronomy and lunar photos, including photos of the proposed Descartes landing site for Apollo 16. Ascent of the LM from the lunar surface, rendezvous, and docking with the CSM in orbit were performed as planned, with docking at 3:36 p.m. EST February 6. TV coverage of the rendezvous and docking maneuver was excellent. The two astronauts transferred from the LM to the CSM with samples, equipment, and film. The LM ascent stage was then jettisoned and intentionally crashed on the moon's surface at 7:46 p.m. The impact was recorded by the Apollo 12 and Apollo 14 ALSEPs. The spacecraft was placed on its trajectory toward earth during the 34th lunar revolution. During transearth coast, four inflight technical demonstrations of equipment and processes in zero gravity were performed. The CM and SM separated, the parachutes deployed, and other reentry events went as planned, and the Kitty Hawk splashed down in mid-Pacific at 4:05 p.m. EST February 9 about 7 kilometers from the recovery ship U.S.S. New Orleans . The Apollo 14 crew returned to Houston on February 12, where they remained in quarantine until February 26. Third manned lunar landing mission and return. Use of mobile equipment transporter (MET). Payload of 32,500 kilograms placed in lunar orbit. Distance of 3.3 kilometers traversed on lunar surface. Payload of 43.5 kilograms returned from the lunar surface. Lunar surface stay time of 33 hours. Lunar surface EVA of 9 hours 47 minutes. Use of shortened rendezvous technique. Service propulsion system orbit insertion. Extensive orbital science period during CSM solo operations. 1972 December 17 - . 20:27 GMT - . EVA Apollo 17-6 - . Crew: Evans, Schmitt. EVA Duration: 0.0458 days. Nation: USA. Related Persons: Evans, Schmitt. Program: Apollo. Class: Moon. Type: Manned lunar spacecraft. Flight: Apollo 17. Spacecraft: Apollo CSM. Stand-Up External Vehicular Activity. Deep space retrieval of film cartridges from Service Module..
1972 December 19 - . Landing of Apollo 17 - . Return Crew: Cernan, Evans, Schmitt. Nation: USA. Related Persons: Cernan, Evans, Schmitt. Program: Apollo. Flight: Apollo 17. Reentry, landing, and recovery were normal. The Apollo 17 command module parachuted into the mid-Pacific at 19:25 GMT, 6.4 kilometers from the prime recovery ship, U.S.S. Ticonderoga . The crew was picked up by helicopter and was on board the U.S.S. Ticonderoga 52 minutes after the CM landed. Manned exploration of the moon had ended. 1990 April 17 - . Death of Ronald Ellwin Jr 'Ron' Evans at Scottsdale, Arizona. Natural causes - Heart attack. - . Nation: USA. Related Persons: Evans. American pilot astronaut 1966-1977. 1 spaceflight, 12.6 days in space. Flew to orbit on Apollo 17 (1972)..